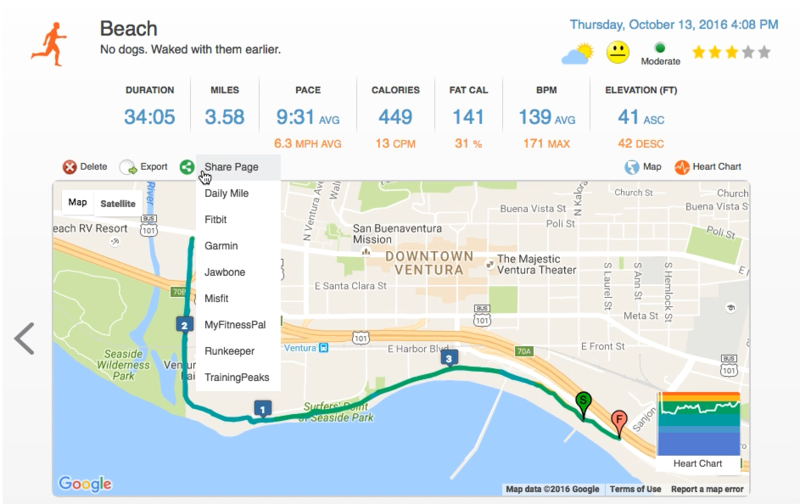 Testimonial by Fitdigits User Len W.
I was introduced to triathlon by a good friend of mine after learning about my new found love for running. I had been challenged by my brother-in-law to compete in the Super Spartan race in Temecula, CA. At that time I was pretty out of shape after getting married and settling into a new career. With only two month to prepare for a race through an obstacle course with no running experience, I needed help in learning how to run and get into shape fast! That’s when I started searching for apps on my iPhone. I found Fitdigits and after reading about the functions, etc. I decided to download it onto my phone and give it a shot. After my first few races and a half marathon I realized that I had hit a wall and was no longer progressing. 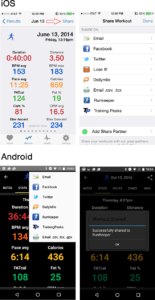 I had just transitioned to Triathlons and wanted to be able to track my running, cycling and swimming. Although the app doesn’t specifically address swimming, I can enter the data and the GPS still tracks me in the water when I place my phone in a waterproof case. What I really liked about Fitdigits was the GPS component and the audible stats letting me know my current pace, average pace and distance traveled. That really helped me improve my overall performance in each discipline significantly and in a very short period of time. My goal was to improve my overall race performance within a years’ time. I had been consistently finishing in the top 20% of my age group and wanted to finish in the top 10% or better. With the help of Fitdigits, I was able to place 5th in my age group at an Olympic distance triathlon placing me in the top 5%! Needless to say I was very happy with my results. I started by establishing a baseline for each discipline and then from there, I would track my performance in each discipline against a set training schedule using the baseline stats as my starting point. After each week I was able to see my progress with specific detail provided through app in the history field. I was quickly able to compare my previous results, on a day to day basis or I could compare on weekly bases and make adjustments to my workout routine as necessary. One thing I especially appreciate is being able to see the duration of my workout, distance traveled, calories burned (huge for me), pace average, CPM avg., and I like to see the Elevation ascent and descent. It really helps me see clearly how I’m actually performing from day to day based on terrain as well. It’s not static. Because the history is easy to see, I can compare how I’m doing really easily. 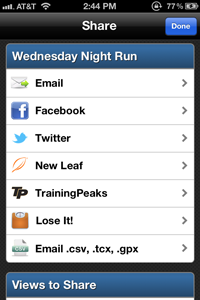 Another huge feature me is how it syncs with my Lose it App. 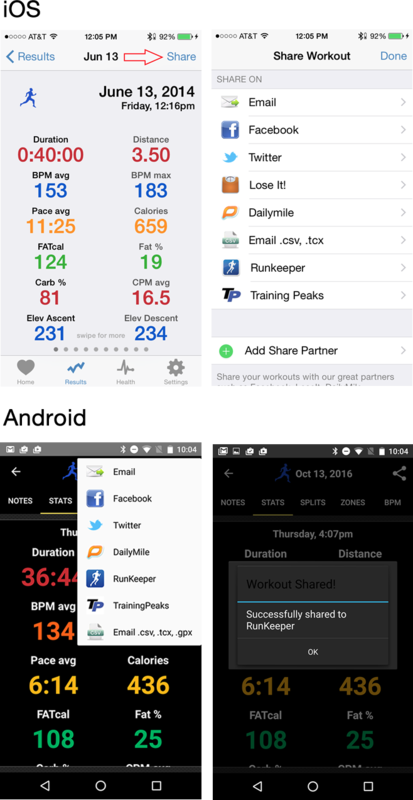 I also track my caloric intake as I’m also adjusting my diet for race day. Another cool feature is the map showing me my route. I’m having so much fun tracking my progress both on the app but more importantly in real life in my events, that I’ve been recommending the app to several friends at work and in my Tri club. 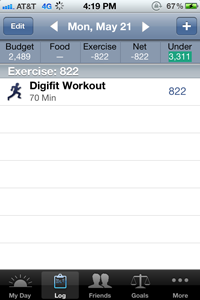 As a result of my training schedule, coupled with the Fitdigits App, I’ve been able to hit my targets and achieve my goals. I’m in better shape today at 49 than I’ve been in in the last 20yrs. I tell my friends that if they want to lose weight, hit a specific fitness goal or improve in their game to get this App! Post Workout Results to Lose It! *Make sure you have downloaded Lose It! and have created an account on your device before starting. 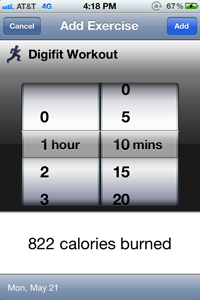 View Your Workout in Lose It!